DMX-CONTROLLED RGB LASER 360MW LZR360RGB-FX Red-green-blue laser with 6 outputs and 24 patterns. 8x DMX chann.. 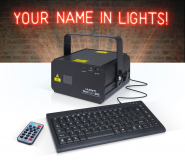 The Laserworld EL-500RGB KeyTEX is a RGB text and pattern projection laser that does not need any software or additional control.. The Laserworld EL-400RGB is a RGB show laser system with a total output power of up to 400mW and a fast step motor with 3-8 kpps.. 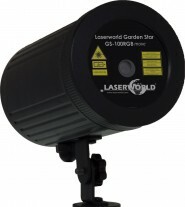 The Laserworld EL-60G is a green single color laser system with a total output power of up to 60 mW. The gree.. 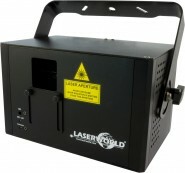 The Laserworld EL-150B is a blue single color laser system with a total output power of up to 150 mW. The blu.. 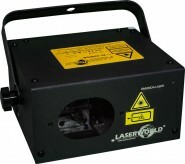 The Laserworld EL-230RGB is a RGB laser system with a total output power of up to 230 mW. The red diode laser m.. The Laserworld EL-900RGB is a complete laser show in one device. It has been designed to especially meet the demands of mobile DJs.. 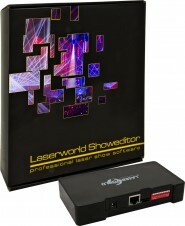 The Laserworld ShowNET LAN interface can be used in different ways and combinations: as interface to Laserworld Showeditor lase..
Multicolour text laser with animations & effects Create rolling, scrolling, animated laser text 3.. The Laserworld CS-1000RGB show laser projector comes with a completely new designed compact housing, which is light weight and has..